There’s something about the way Gail Neuman explains how she constructs a sculpture that inspires a likeness to an architect detailing blueprints for a building. 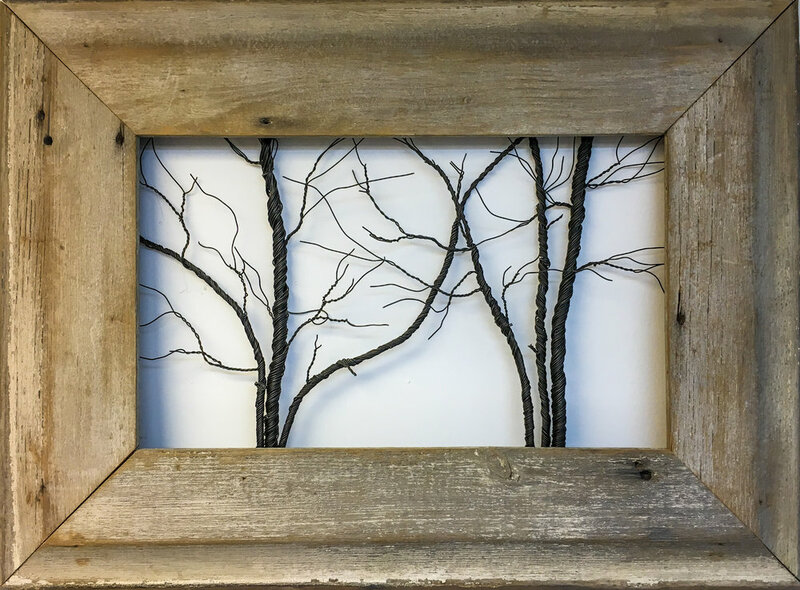 The Long Island-based craft artist reshapes fine steel wire into bare trees and places them in frames that she builds first to serve as the foundation for each piece. She salvages and recasts wood from window and mirror frames and siding from houses. When aged wood is unavailable, she launches the excavation process that produces a similar effect. “I’ll take the wood, paint it, bury it in my garden and water it, dig it up in about a week, throw more paint on it, bury it again, water it and I’ll get a weathered look,” she said. Neuman cuts each wooden slat at straight or diagonal angles and joins them into a frame; then applies a sealant to repel bugs and mold. Frame sizes and styles are determined by exhibition requirements or the demands of a client’s aesthetic that sometimes call for virgin wood. Most frames are set upright but a windblown willow or a forest of birches require horizontal settings. A tree exhibited in the lobby at The Omni, a corporate building in Uniondale, is an atypically large piece. 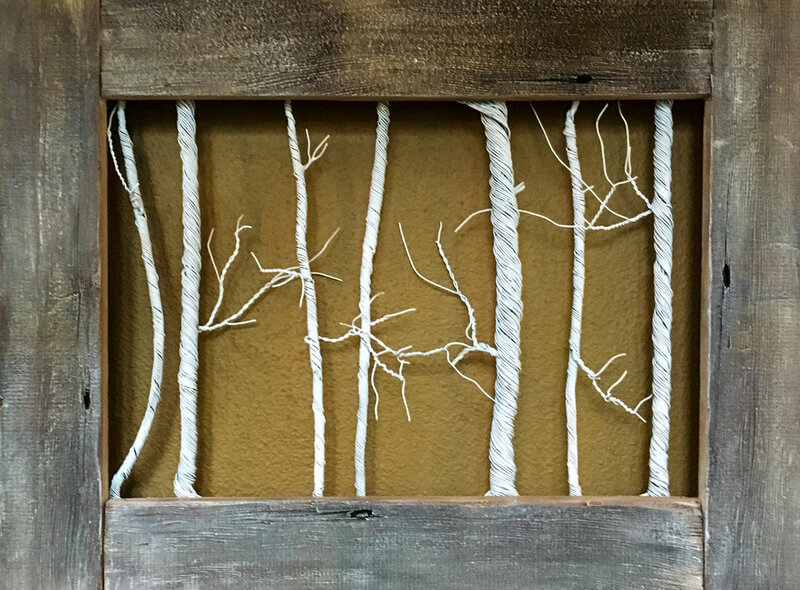 Housed in a 31-by-46-inch frame of paint-chipped wood repurposed from a demolished Pennsylvania home, the poplar-like recreation sports a short trunk and elongated, fanning branches made of 18-gauge black wire that twists like licorice sticks. Neuman buys the wire in large rolls from an art supply store and their gauge, from 16 to 22, is another important determinant in her constructions. The higher the number, the thinner the wire and the easier it is to manipulate to Mother Nature’s, or rather Mother Neuman’s liking. She cuts the layers of wire individually to create certain effects. Next, she must consider how to hang each piece. A tree’s weight mostly dictates the type of D-ring hooks to use. “I don’t like to set the hooks ahead of time in case I make the tree too top-heavy,” she explained. Each piece can take up to four days of six hours to complete. She has created some 25 pieces since she returned to working with wire two years ago. That’s when a photographer and fellow member of a women’s art group asked Neuman to translate her black-and-white image of a leafless tree into something three dimensional. For this inaugural project, Neuman initially employed copper wires but their sheen made the trees appear too artificial. She switched to black steel wire leftover from her days teaching primitive decorative painting and selling furniture with rusted steel and reclaimed wood until the early 2000s. One among five girls growing up in Islip in the 1950s and ’60s, Neuman and her sisters were always making stuff, including parade costumes, dollhouses, forts and chalk drawings on sidewalks. She also helped her father build balsa wood airplanes and learned to work on car motors, changing oil, spark plugs and the like. At 16, she started teaching crafts to the Suffolk County Girl Scouts and, later, to national scout leaders. In high school she excelled at math and science and her educators steered her toward considering a career suited to her strengths. Yet she wasn’t permitted to take a mechanical drawing class, her first chance at formal art training. After earning a scholarship for biochemical engineering, Neuman left college after two years to pursue a living in creative arts. She opened a ceramics shop where she taught pouring and throwing clay and crafted miniatures for dollhouses at night. By day, she was a clerk issuing marriage licenses for the Town of Islip and taught crafts at the recreation department’s summer camps. Now, at 68, Neuman is juggling options between crafting, exhibiting and selling beaded and metal jewelry, intaglio prints on self-made paper, welded found objects and glasswork. Her balancing act, though, pivots on doing same with her winter trees that are currently displayed at six galleries from Jamesport to Sayville to Huntington and that adorn her patrons’ homes and restaurants. Meanwhile, she’s flirting with ideas about creating wire trees for all seasons, particularly autumn. She’s drawing the blueprints in her head, envisioning thicker wooden frames to provide a ground, a foundation, where fallen leaves can pile up.